In a letter dated February 20, 2014 addressed to His Beatitude, Metropolitan Volodymyr of Kyiv and All Ukraine, His Beatitude, Metropolitan Tikhon offered words of support and prayers on behalf of the bishops, clergy, monastics and faithful of the Orthodox Church in America in the wake of the escalating crisis gripping Ukraine. As noted in the letter’s concluding paragraph, all parishes, monasteries and seminaries of the Orthodox Church in America are asked to include a special petition in the Litany of Fervent Supplication for the suffering Ukrainian people and nation. I extend to You the shared pain and sorrow of the bishops, clergy, monastics and faithful of the Orthodox Church in America over the crisis facing your country, in particular the violent clashes in Kyiv that have shocked the world. May our merciful Lord, Jesus Christ, grant rest in paradise to the many people who have lost their lives and grant His divine healing to those who have been wounded. The question now before all Ukrainians is this: Will the bloodshed serve to bring an end to the violence, or will the bloodshed lead to more violence? This is a question put to the conscience of every citizen. This question is put to the government and to the protesters. 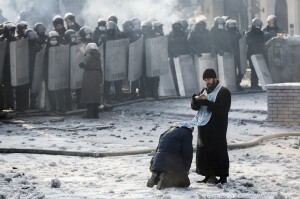 During the confrontations of the last months the voice of the Ukrainian Orthodox Church has appealed for non-violence. In this appeal You have been joined by other churches and religious communities in Ukraine. We are grateful for this moral witness for a peaceful and just society. We grieve that this witness has not prevented the descent into bloody violence. At this time of great danger, it is only the Christian witness to peace and justice which can bring about a decisive rejection of violence, thus saving the lives of many and saving the Ukrainian nation and society. This message is written to Your Beatitude, and through You to the bishops, clergy, monastics and faithful of Your Church, as a heart-felt message of prayerful support for the mission of Your Holy Church as a peace-maker in the nation and society of Ukraine. At this time of danger, the Orthodox Church in America joins Your Holy Church in fervent prayer and supplication to God. These words of the Prayer of the First Hour are a guide to us all—whether in Ukraine or in America: O Christ, the true light who enlightens and sanctifies every man who comes into the world, let the light of Thy countenance shine upon us, that in it we might behold the unapproachable light. Guide our footsteps aright to the keeping of Thy commandments, through the prayers of Thy most pure Mother and of all Thy saints. We ask our parishes, monasteries, and seminaries to include this petition for the suffering Ukrainian people and nation in the Litany of Supplication: That the people of Ukraine be granted the wisdom, mutual respect and love which will protect them from violence, preserve them in peace, and bring them unity and justice, let us ask of the Lord.